I don’t know about you, but many of my days are busy. Too busy to have the calm aura I once thought being a stay-at-home mama would embody. Between moms group, household chores, helping with my husband’s business, and hobbies that keep me sane, I often have to remind myself that my real calling is to raise my daughter. When busyness strikes I’ve learned to focus on a short acronym to keep the love and attention flowing with my toddler – L.O.V.E. Magical moments can be found when they are surrounded with a giggle. Find fun in the little things to do with your child that evoke a laugh or snort. My 18 month old currently thinks it is hilarious to balance things on her head, hide under blankets, and dance together to music. What makes your little one laugh? Every day I find myself completing monotonous, hum-drum activities. Things like diaper changes, driving, making dinner, folding laundry, picking up clutter, and other chores. 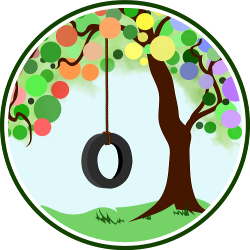 I’m conscientiously choosing to take the opportunity to include my daughter in my daily activities. We identify body parts while changing diapers and visit about what we see out the window as we drive. At home, she helps me sort laundry by finding socks and towels and she is the best helper when it comes to putting clean utensils away. Many days we plop down amidst the clutter and read a story (or three!) together. All of these activities take longer when we do them as a pair, but it is a simple way for me to grasp the opportunity to show her extra love. What truths to do you speak to your child? So much of the world is deemed adult only or not kid-friendly. 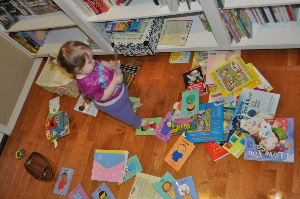 Whenever I run across something or some place my daughter can freely explore, I encourage her to have at it! Along this line, I seek out safe places where she can explore, learn, and independently play. Whether it be the library, a park, or inside the kitchen cabinets, I’m always watching for places she can benefit from a good dose of exploration. 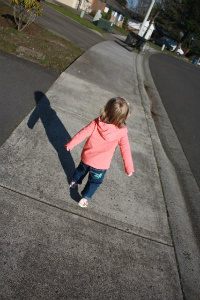 It has been such a blessing to me to follow along behind her as she discovers new things, like her shadow. I can only imagine the discoveries I’ll witness in the coming months and years. By allowing her the time and space to explore she is expanding her world with my support and love. The next time you find yourself with 10 minutes, remember how you can LOVE your child through laughter, grasping opportunities, voicing truths, and encouraging exploration! How do you show love to your child/ren when surrounded by the busyness of parenthood? Thank you for a beautiful reminder that it really only takes a short time to realise the good in life. You’re welcome 🙂 It was just as much a reminder for myself too! Thanks for reminding me to find time in the day to show my love for my kids. It’s easy to get caught up in all the busy work of being a mom!!! I needed this reminder today — thank you!